National Coney Station on Grand River Avenue in East Lansing. As readers of this blog know, the thing I love most about food is regional cuisine. Sure, I may not like everything that makes a region popular, but I love the idea that no matter where you grew up, there’s going to be some brand, food, or preparation technique that will always make you think of home. In Michigan, that food is the Coney Dog. I’m not a hot dog eater, so it’s not something that I’ve been able to adapt to. I’ve tried it once and wasn’t a huge fan only because I don’t like the dog. The chili is delicious and I could eat that without the hot dogs. There are always imitators when it comes to a region’s marquee cuisine. Yeah, you can get a coney dog here in Lansing, but up until last week, you couldn’t get it from one of the big names in Detroit coney’s. 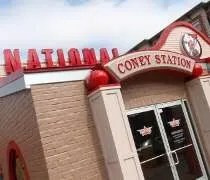 National Coney Station opened up on Grand River Avenue in the building that was most recently Moe’s Firehouse. Before that, it was a Spartan Gyro. National Coney did a lot of work to the building to clean it up. I never got a chance to eat at Moe’s before it closed, but for some reason, the place always scared me a little bit. Here’s a cool idea. Go State! From Eastwood Towne Center’s Facebook page. When the MSU football team wins, you receive a % discount on your total purchase at Maggie Moo’s on gameday! The discount is equal to how many points MSU scored. Ex: If MSU wins 27 – 7 You will get a 27% discount! If there are any night games, discount will be honored on that Sunday. We invite MSU football fans to highlight your tailgate party and support the homeless by showcasing your football traditions. Haven House is compiling a tailgate cookbook, “Tailgating on the Banks of the Red Cedar” as a fundraiser to help support homeless families. All proceeds will benefit Haven House. Haven House provides emergency housing and support services for one-parent and two-parent families with children. The shelter helps families who are homeless prepare for permanent housing by developing and promoting self-sufficiency, stability, and financial responsibility. To be considered, you will need to have the information available for our volunteers on game days, or submit your recipe and story by email at tchenault@havenhouseel.org, or by fax to 517-337-2910. 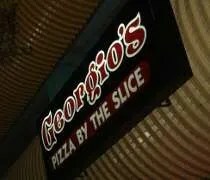 Georgio's Gourmet Pizzeria on Charles Street in East Lansing. I love late night pizza-by-the-slice places and I love living near a college town that has many places to fill that late night craving. J got home from work just before midnight like she always does and I said, “I’m hungry” like I always do. This time, she said she had a taste for pizza or tacos too. We debated the pros and cons of each and eventually settled on pizza. Since there’s no place on the south side of Lansing to get a slice at midnight, we trekked to East Lansing. Beginning Friday, Spartan fans can get Final Four Fudge Dribble ice cream at the Michigan State University Dairy Store. The vanilla ice cream with fudge swirl sprinkled with little chocolate-covered malted milk “basketballs” is being made on campus today. I’m working in Ann Arbor most of the day on Friday, so I’ll have to convince J to head over to East Lansing to pick up a gallon. Even without the Final Four name, it sounds like a tasty ice cream. El Azteco on Ann Street in downtown East Lansing. I have no idea why I’ve been craving Mexican lately, but it’s been like an everyday thing. J’s step-dad headed back to Chicago, but her mom stayed for another day. We made a run to Howell after breakfast then did some grocery shopping at Horrocks and Walmart. By the time we got home, we were all starting to get a little hungry. I sat down in front of the computer and asked what they were in the mood for. To my surprise, J said Mexican which is what I was thinking. Instead of going to one of the two places that are close to our apartment, I wanted to go to East Lansing and try one of the most popular restaurants in downtown. El Azteco is on Ann Street near the Marriot in a that strip of restaurants at the corner of M.A.C. and Ann. 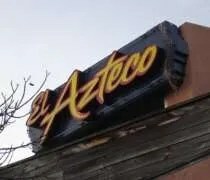 From all the things I’ve read, El Azteco made it’s name at a different location a few blocks that wasn’t nearly as flashy or noticeable as the new building. While I love atmosphere, restaurants don’t survive without good food. It was the good food we were really after. 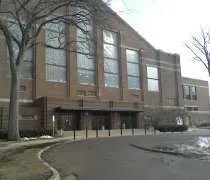 I wish my first visit to Jenison Field House was thirty years. When I walked in to the building for the first time, the first and only thing I could think was, “I bet this place was loud.” I knew of Jenison before I moved to Lansing. Who hasn’t? I loved watching the old clips of Magic Johnson in East Lansing. I can only imagine what the place was like. Sure, it’s huge, but those big cavernous ceilings had to make the place loud. Jenison Field House is on the campus of MSU just off Kalamazoo Street. It’s just a block or so from it’s replacement, the Jack Breslin Student Events Center (review HERE). It’s a huge building. At first, I was wondering how they would even do basketball, but figured it out after seeing the wrestling set up.